Twenty-eight T-shirts in 90 minutes — that was Jennifer Cerasin's challenge Friday, Nov. 16. 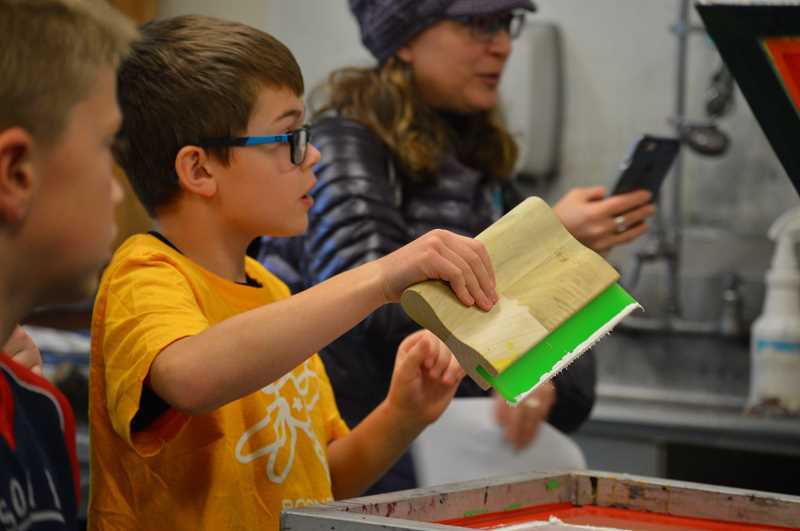 The Arts and Technology High School art teacher and her printmaking students helped nearly 30 Boones Ferry Primary third-graders in Stacey Parent's class print designs on shirts. "I think it is always great when older and younger students can work together, collaborate and learn from each other," Cerasin said. "Both age groups benefit from the experience and create a greater sense of community. The older students are reminded that they have grown and come so far and the younger students gain perspective into where they are going." Parent's class was awarded the opportunity to create T-shirts through money raised from the Fun Run, the school's annual fundraiser in September. Parent's class raised more than $3,600, and one student in her class, Hayden Dorn, raised $1,538 alone — the top winner of the school. Individual students who raised the most money received individual prizes. T-shirt making was one of the class prizes. "This was our reward and kids got individual prizes as well," Parent said. "Two of my kids got a limo ride to Peachy Berry and then some of them got to go to a dance party. There were other prizes like pizza parties and those kinds of things." Cerasin collaborated with students and Parent to come up with the shirt design. They settled on a dragonfly dressed as a runner on the front because the Dragonfly is the school's mascot and the reason for making shirts was because of the Fun Run. Student names were printed on the back of the shirt. Dorn, who rode in the limo to the frozen yogurt shop and participated in T-shirt making, said it was interesting to watch the process of printing designs on shirts. "It's cool to see how they make them and put designs on it," Dorn said. Cerasin said the process involves creating a design in black and white before transferring it to a transparency and then burning it into a screen that is coated with light sensitive emulsion to create the stencil in the screen. "We use the screen to print the shirt by pushing the ink through the screen with a squeegee over the press," Cerasin said. That's what the third-graders helped with. "This medium requires special equipment such as a light box, dark room and pressure washer. It is a great example of how science and art come together." Many Art Tech students who helped with the printmaking were new to the class, which had not yet taught the photosensitive stencil screen printing process. "I gave them a quick lesson, but they will be delving into it deeper in the upcoming weeks," Cerasin said. "The students who did the hands-on printing with the grade schoolers have taken printmaking before." Cerasin added that some of her students have younger siblings so they contributed ideas for how to entertain the younger students like giving them coloring activities while they waited. they can possibly do later on in life that they'll enjoy,"
said Art Tech senior Andy Larson.